When it comes to foods rich with antioxidants, the tomato is one leader in the good health category. 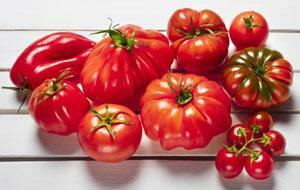 Tomatoes are chock-full of lycopene: the carotenoid pigment that gives the tomato its dark red color. Lycopene is a natural antioxidant that has been shown to lower risk of certain types of cancer, including cancers of the lung, prostate, and stomach. And tomatoes are an excellent source of vitamin C and beta carotene, a very good source of manganese, and a good source of vitamin E. Another health benefit from tomato’s lycopene content is bone health. In a small bowl, mix together 1 tablespoon olive oil and garlic. Brush olive oil-garlic mixture onto 1 side of each bread slice. Place bread, oiled side down, on grill; cook about 2 minutes, until slightly toasted. Turn bread slices over. Place tomato slices on top of bread, overlapping if necessary. Place cheese slices on top of tomato slices. Cover grill and cook about 4 minutes, until cheese starts to melt. Transfer to platter. Place 2 basil leaves on top of each sandwich and drizzle with remaining 1 tablespoon oil and the vinegar. Sprinkle with salt and black pepper.